Our good friend 45RPM has set up an online shop just in time for Christmas, over at Etsy. An Illustrator, Street / Graffiti artist, lover of top hats, beards and owls (according to his profile), 45RPM is also one third of the infamous Bristol based What Collective who has been hitting the streets of Bristol for a number of years. His shop features a selection of original works painted on a variety of objects including skatedecks and vintage tin lids. 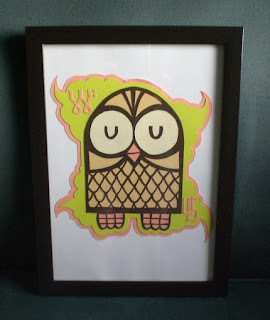 One of our favourites is this Owl paper cut-out pictured above. Go check the work here. After visiting the online shop, stop over at his flickr page which gets updated almost everyday. hi i have a piece of art homework to do on 45rpm can anyone help me find info on the artist himself PLEASE????? ?